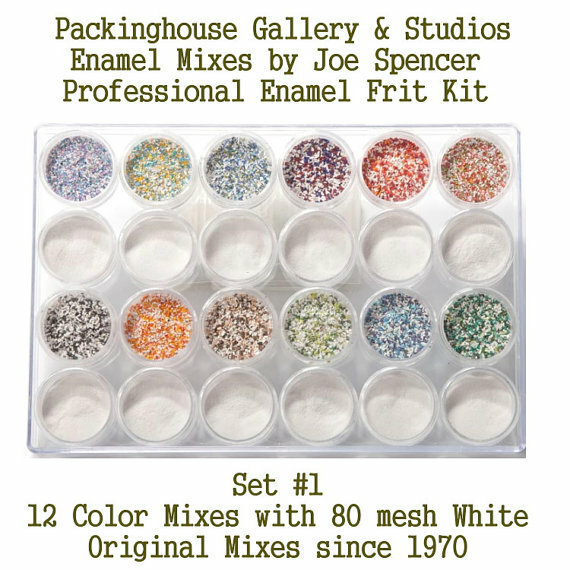 Thompson Enamel Original Enamel Mixes by Joe Spencer Professional Enamel Frit Kit (Set #1) As many artist know, enamel is not cheap, we've created this Professional Enamel Frit Kit in hopes of helping artist be able to have a lot of color with out spending a lot of money. These Enamel Frits can be used with Silver, Gold, Copper, Bronze and Steel. Professional Enamel Frit Kits are great for those of you who like to have every color there is, before buying larger quantities. The Professional Enamel Frit Kits are also helpful to the artist that like to make one of a kind beads without having waste. Great item for gift giving. This kit works well for artist of all types and teachers. Please keep in mind, a little enamel goes a long way. Most of you know this already, but for folks just getting into enameling, its a whole new world with fun possibilities. ** Please Note*** This enamel kit is available in the following sizes Small Frit Medium Frit Large Frit A drop down menu will help you pick what size will work best for you. ! Small Frit is fun to use with smaller pieces or delicate work Medium Frit is the perfect size to make beads or focal pieces Large Frit is great for larger pieces, swirling techniques and sculpture. Joe has used these colors in his workshops since the 70's. You will receive 12 small jars: Base Coat Color White (use first) 80 mesh You will receive 12 small jars: Enamel Frit Top Coat Colors The colors in this Enamel Frit Kit #1 include: Blue Green Red, White and Blue Brown Orange Blue Green Easter Purple Christmas Black and White Red Aqua Green Photo shown is what you will receive and how it is packaged. Jars are 1 1/2 inches across and 3/4 inch tall, see through plastic. The beads do not come with your order. The bead chart shown,is there to show you the color combination results. If you desire to make beads, we have bead blanks of all shapes and sizes on our site. Our cylinder beads are fast and easy to work with. Great results for all artists no matter what your skill level is. 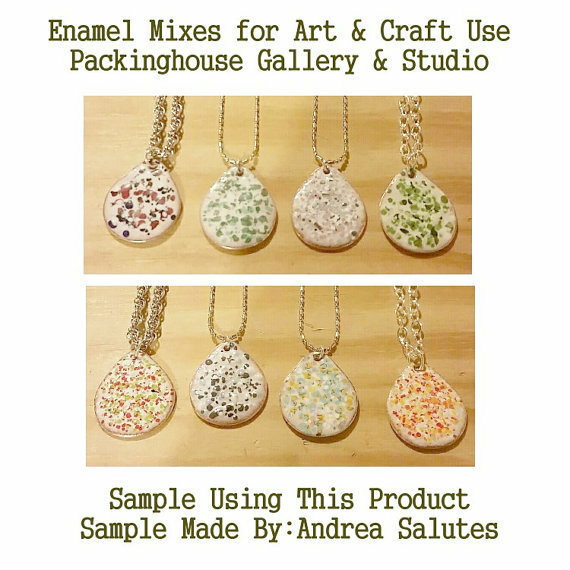 —————————— How the any of our Enamel Mixes and Blends/mixes are used. Joe Spencer's Original Torch Fire Technique. This is a short over all description of how this product is used to make copper enamel beads. You can also use any of the mixes or blends on any copper blank shapes too. If you need lessons please contact us by email Enamels@PackinghouseGallery.org Take your base coat and place 1/2 of the jar contents on your work surface. Take your color mix and place 1/2 of the jar contents on your work surface. Try to be careful not to mix the two piles on your work surface. * we use the line tool that Joe makes to keep the piles neat and separated. Using your mandrel, carefully heat your copper bead and then roll the copper bead into the base coat pile to cover your bead, fire. Repeat this process 2 - 3 times until you have completely covered your bead. The base coat is always used first. Heat the bead again and very carefully roll your bead into the color mix, and fire. Cool your bead in cooling tray. As your beads cool down, you will see color change, this usually takes a couple of minutes. This is normal. * we use Joes Bead Pulling Station when creating beads. It just makes life more fun and simple ——————————— Common Sense and good safety practices will go along way. We can not be responsible for your safety. Always use proper equipment and safety gear when using any torch firing equipment. Please note: We do everything we can to try and produce photographs that show the true color as they appear in our studio. However your computer monitor and our monitor may not be the same. 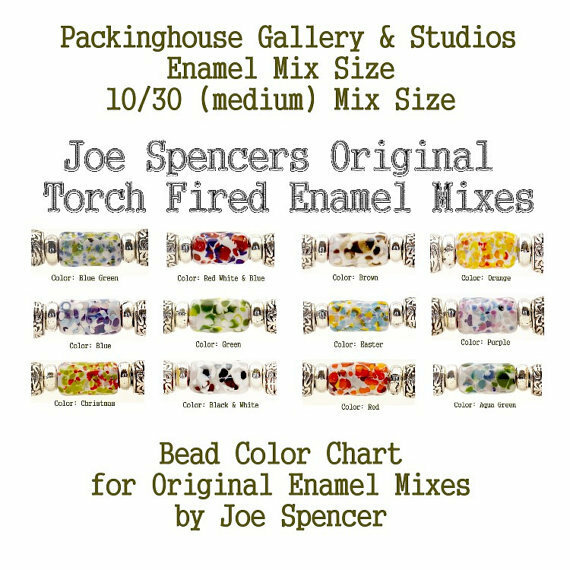 If you have questions about this product you can email us Enamels@PackinghouseGallery.org or call us 727-596-7822 Eastern Standard Time Zone. Thank you ------ This year 2016 my wife Cheryl Anne wanted to make beads for our customers. She asked me to cut and clean some beads for her to use. I cut her some small hole 1/2 inch size cylinder beads. Joe and I made many of this size bead, but he liked that size too so we did not have any left to use. So on Friday December 2nd, Cheryl Anne decides she better start making the beads so she can include a bead in each of the customers orders going out in December. She wanted to get this done right away. She spent most the day making beads for our customers. She used Joe Spencer's, Original Enamel mix called Christmas, since the beads would be given away during December it seemed the natural choice. She pulled out a small size set from the drawer and went into the studio. My wife uses one of Joe Spencer's older Original Bead Pulling Station. He made her a special set up to make her beads back in 1999. I think she will wear that thing out in about another 30 years. She likes to roll the bead 3 separate times into the base color, then she uses one coat of the frit and holds it into the flame to watch the color spread out. She kept doing this for hours. Then she finally ran out of gas. For those of you who know my wife, that is the only way to get my wife to stop making beads. She would make them all day, if she could. I’ll go tomorrow and pick up some more gas for her. She let the beads cool in the bead pulling station. Then the next day, she pulls the beads out. She likes to sand the edges and clean out the hole areas. She feels this extra step just makes the beads look nicer. She could not believe it. She made 57 beads that day. She was quite surprised to find out that she had used only 1/2 of her enamel bead mix ! When we say that a little mix goes along way. Well, its true ! If you think about it for a minute, she made 57 beads and still has 1/2 of her mix left. Which means she could make over 100 beads with that small amount of mix. No wonder our customers love us. The money spent is worth every penny of the fulfillment and joy of making your own beads. We hope you enjoy our enamel mixes as much as we do. If you ever have any questions feel free to email us Enamels@PackinghouseGallery.org or call us EST 727-596-7822. If I don’t answer, please leave a message and I will call you back. Thank you.